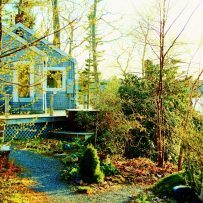 Paradise Cottage, on Paradise Point Road in East Boothbay, has 4 weeks open (July 20 – Aug 16) at the height of summer! Contemplate relaxing water views, nestle into the woods and gardens from the sitting/dining area on the porch, or borrow our kayaks to paddle at the head of Linekin Bay. Quiet and sequestered, yet only 3 miles from Boothbay Harbor. Floor to ceiling windows bring the outside in, or enjoy private outside living.